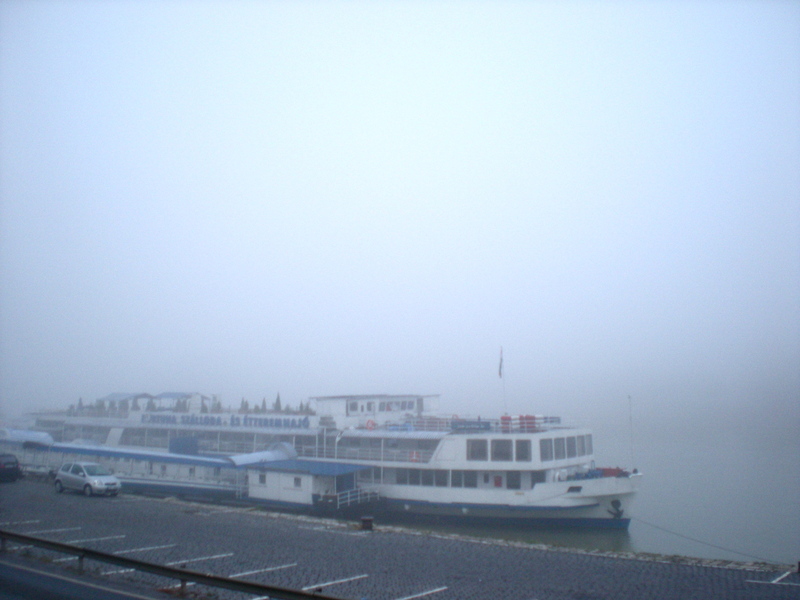 It was a very foggy six am this morning, so thick, in fact, that we couldn’t even see across the river to Buda. Even as I sit here now at nearly 9am at my desk facing the river and the water tower on Margit Island, I can’t see the steady-moving river. Probably by eleven, the sun will burn most of it away. Despite the humidity, it was such a peaceful run today. It had that quality of dream-running, which every runner knows by sensation rather than the visual details. The heart is pounding, legs moving, lungs expanding and contracting, and yet somehow the view is blurred by the pale sheet of dreaming. Like mist. Or, like this morning’s fog. And because it is Friday we decided to take a different route home, in order to swing by the bakery to get a few fresh kiflis (simple crescent bread with salt on top). And I don’t know if it was the the different route through old 13th district, or whether is was because of the fog, but I saw so many new things I had never seen before. Street signs, old cafes just turning on their lights and preparing their pastries, vegetable stands where owners with their 4am hair lightly water and sweep the stoops. And on Visegrádi utca this strange little inlaid statue of a saint pouring water onto a burning building. It looks like it says Saint Flora, but she is the patron saint of the abandoned, converts, single laywomen and victims of betrayal. So maybe they cut the name short or smashed it into the bottom, just out of sight. 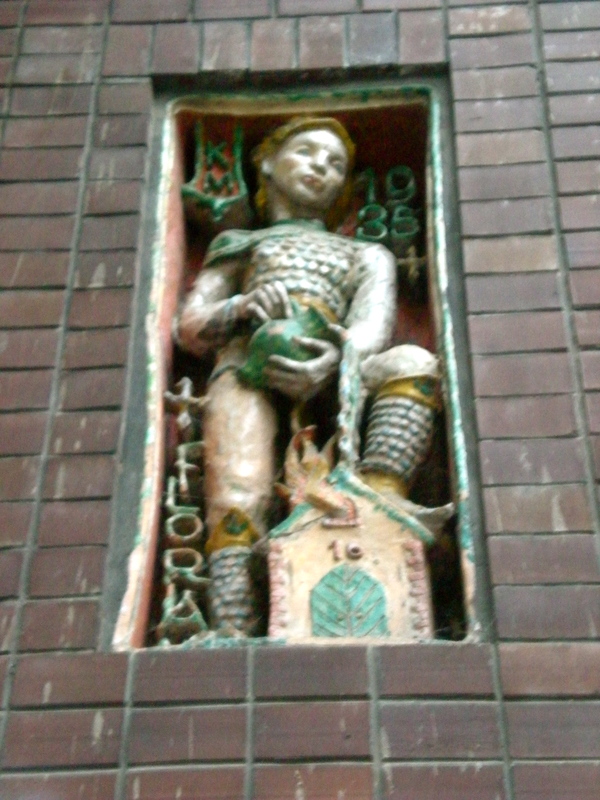 Saint Florian, who is the patron saint of chimney sweeps and fire fighters. The date: 1935. 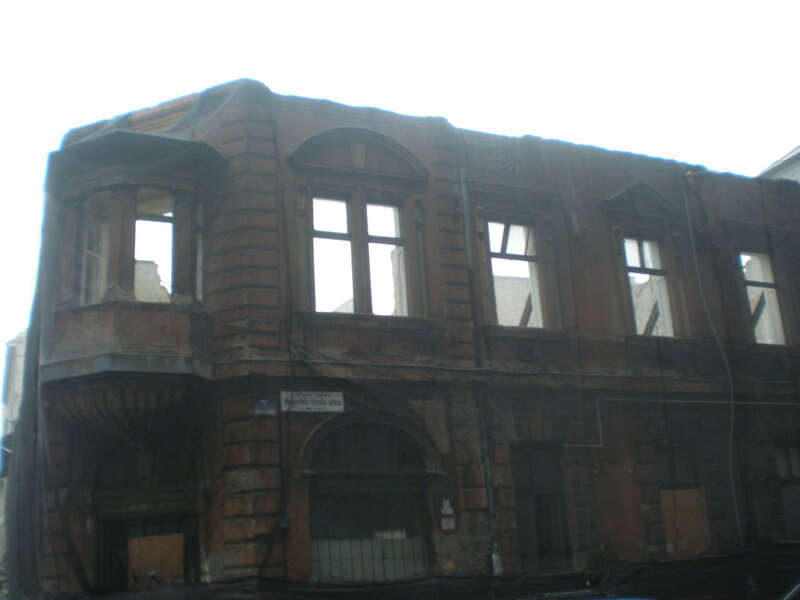 And the building was built up again, perhaps damaged again during the war and other occupations, and still stands today. It’s amazing what you notice in the fog. Probably because your eyes are just waiting for a cleaning and then you really take in what is available to be seen. And I know that there is an undisciplined tendency to use words like “perfect” on Fridays, but it was a good morning. This weekend is the cheap movie weekend here–film days–film napok. Almost all movies throughout the city are 500 forints per ticket ($2.75) regardless of the time so I think that we’re going to go. And if the weather holds, we’re going to try to explore the pest side of the river closer to Elisabeth Bridge. And if the weather doesn’t hold, I won’t mind it. I’ve really enjoyed the rain in the last two days and what has been lingering in the air after it falls. I don’t know where to start. First of all, I love your photos. I just came back from ony a 4-day visit to Budapest and something captured me about the city which I cannot entirely put my finger on. Perhaps its the emergence of a new and developing country, and the hope attached to that, the calmness I felt in the streets despite the largeness of the city, and what seemed to be a quite warm people. I imagined myself taking a longer trip there to stay a while. Then, of course, these sorts of travels are like a blank canvas ripe to project all of our fantasies upon. I am very curious to know what it is like living there. You are American, right? Are the people welcoming, is it safe, is there much of an artistic community, how does it compare to our cities? I guess I’m really giving you some broad outlines but would love to hear about your experiences. Are there opportunities for work there? Have you been able to make Hungarian friends? Hi Mark! Thanks so much for your nice comments about the photos. I hope to get a better camera soon so I can really start to do justice to the region. Budapest, and Hungary, is a very complex place. And I think a lot of visitors feel the same way that you do when you come (at least observant ones!). It’s a place that is really caught in both a very ancient history full of invaders and struggles and revolutions– and then also the emergence of a new, contemporary government and culture. That dichotomy is especially felt in Budapest where there are both older people who, in many ways, romanticize the old ways and old times, and younger people who are trying to move into a more internationalist system. And of course, the city itself represents that. Yes, I’m American, and yes, almost everyone I have met have been welcoming and friendly. And even though there is crime just like in every “big” city, compared to America it’s quite a safe place. Where are you from? As an artist myself, I would say that compared to other places I’ve lived in America, there is quite a large artistic community here. But that’s Europe, too. There is more emphasis on art and respect for artists. And Hungarians have a very long history of being artists and respecting the arts. In terms of work opportunities, it depends. Are you American? It’s not the easiest to get a job as non-EU citizen here, but there are a lot of programs that you can sign up for to teach English. That can get you here, and then you can sort of go from there. I have a very amazing set of Hungarian friends and luckily they have been really great at helping me and showing me around and translating when I can’t quite order the right drink! But almost anyone who can speak even passable English here is more than willing to help.